Design Restaurants launches its eagerly awaited fine dining finder App service for iPhones The App lets you quickly and easily view all accredited inspiring and original restaurants in your area or desired location, research their suitability with pricing and offers to help you visualise and book the right choice. 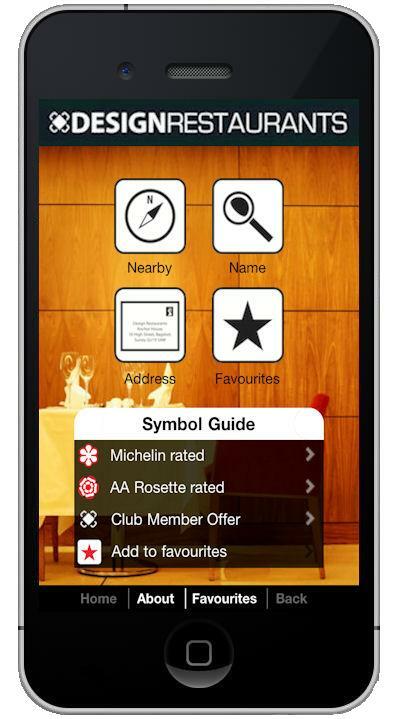 This free App is a constantly updated reference guide and booking facility using the collective knowledge of Michelin, AA, Good Food and Zagat guides with respected reviewers and the best of the new openings. The App is available immediately for download on the iTunes App store. Compatible with iPhone, iPod touch and iPad. Requires iOS 4.0 or later. Apps for Blackberry and Android coming soon.